Four girls. One dead body. A whole lot of guilt. Alice and her best friend Cass are stuck in a cabin with Polly, the social outcast, and Rae, the moody emo-girl. Then there’s Tara – queen of mean. Powerful, beautiful and cruel, she likes nothing better than putting people down. A compelling story of guilty secrets, troubled friendship and burgeoning love. (Summary from Goodreads.com). Drawing on scenarios more usually encountered in teen horror movies, Torn is the gripping story of schoolgirl politics getting way out of hand. Cat Clarke’s follow up to bestselling debut novel Entangled takes a fresh look at what happens when a group of teenagers are given a taste of freedom on a school wilderness trip… with truly disastrous consequences. 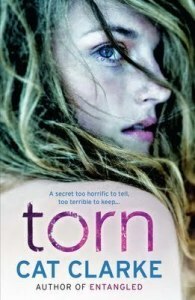 Part murder mystery, part psychological thriller, Torn is essentially a book about growing up – think coming-of-age story, but terrifying. It’s about that moment when you realise that crying to your parents or hiding behind the sofa won’t fix things – that sometimes life can spiral out of control and there’s no way back to the safety of before. Narrator Alice King is the type of character that readers will instantly empathise with. At school, she’s neither queen bee nor outcast, instead occupying the no-man’s land between the two extremes. Like many of us, she’s accutely aware of the injustice perpetuated by the in crowd, but not quite brave – or powerful – enough to befriend those deemed Untouchable. Her own acceptance is far too tenuous to take such a risk. With insight and dark humour in equal measure, Torn really digs down into the truth about the high school social order, going beyond the simple mean-girls-vs-losers dynamic we often see perpetuated in popular culture and holding the mirror up to a reality that’s far more complex. Cat Clarke is an edgy writer, and that’s her strength. She doesn’t write tidy stories where enemies are safely dispatched and a happy ending is guaranteed for all. She writes in shades of grey, and the result is honest and raw narratives where things get messy and hearts get broken – sometimes readers’ hearts. Even the love story that unfolds alongside Torn‘s central mystery is conflicted, brimming over with bittersweetness of the most poignant variety. Like Entangled, Torn sees its teenage protagonist forced to confront uncomfortable truths about herself, and in both cases that makes for fascinating reading. But where Torn surpasses Entangled is in the way it takes us on our own journey of self-discovery – the way Alice’s story feels as though it’s only one wrong decision away from being our own. Seriously scary stuff. Torn is one hell of a book. It’s stomach-churningly tense, twisty in the cleverest way and completely impossible to put down. I read it straight through in one go, on the edge of my seat, only pausing every now and then to remind myself to breathe. If you like your YA fiction dangerous and authentic, Torn is a must-read.